Are You Doing a Hit-or-Miss Job at Diversity & Inclusion? The answer may be yes. The key to your business's endurance and success is you getting it right. Are you giving them permission to fail and ways to fly? Is your business environment designed for success? Do you know how to nurture this value and help it grow/help them grow? If You're Not Focused on the Inclusion Part of "Diversity and Inclusion," Then You're Doing It Wrong. Having diversity in your organization is only half of the equation. Inclusion is what makes it meaningful. 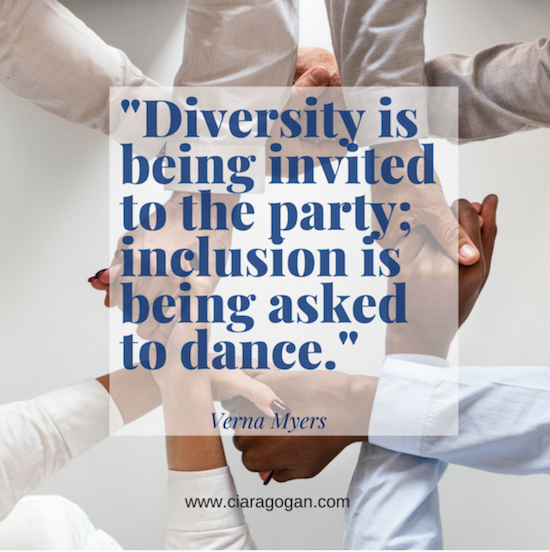 Verna Myers, diversity and inclusion expert and consultant says, "Diversity is being invited to the party; inclusion is being asked to dance." If you don't ask all of your employees to dance, you are not providing a work environment where your employees and customers can thrive, and you're not building a sustainable business. "This kind of leadership is a conglomeration of six behaviors: ensuring that team members speak up and are heard; making it safe to propose novel ideas; empowering team members to make decisions; taking advice and implementing feedback; giving actionable feedback, and sharing credit for team success. Of employees who report that their team leader has at least three of these traits, 87% say they felt welcome and included in their team, 87% say they feel free to express their views and opinions, and 74% say they feel that their ideas are heard and recognized. For respondents who reported that their team leader has none of these traits, those percentages dropped to 51%, 46%, and 37%, respectively." Quick calculation for you, when leaders don't have inclusive traits, each of the numbers dropped by over 35%. Can you afford for your workforce to be 35% less included and free to express themselves? So, what can you do about this? The answer is open dialog coaching. At the intersection of employee engagement, diversity and inclusion, and your employees are open dialog coaching. It's where you learn to support and engage your LGBTQ co-workers. It's where your women in STEM learn to trust you have their backs, and it's where your company goes from simply being the place they work to the place they want to make a difference for you, your customers, and each other. 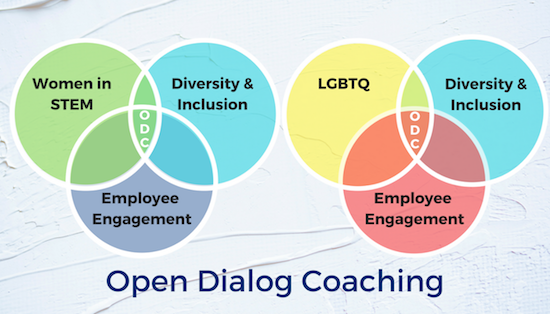 My open dialog coaching program benefits your LGBTQ and women in STEM employees and the people who work with and manage them. Open dialog coaching creates a better understanding of each other, a safe environment in which to explore our differences, our similarities, and how to best help each other thrive. When You Understand How to Nurture All of Your Employees, Not Just the Ones that Are Like You, You Allow them to Bring Their Whole Selves to Work. Providing a work environment where your employees can show up with integrity and authenticity will differentiate you. You'll be an employer of choice, giving you a competitive edge in this hot economy and improving your employee retention. The open dialog coaching program consists of workshops, one-on-one coaching, group sessions, and deep-dive work with your leaders, teams, and LGBTQ and women in STEM employees, as appropriate. It is customized for your company or organization and designed to maximize and realize the potential within. As a member of the LGBTQ community and as a woman in technology for 20+ years, I have a unique vantage point from which to help your business become a more welcoming, nurturing place for all humans to thrive. I can help you, and your organization open up a dialog with your LGBTQ and women in STEM employees, benefiting you, your bottom line, and the people who work for you.